Choosing the right locks for your new door is an extremely important process, and one that requires some time and thought. Most homeowners conduct their own research and also consult professional locksmiths to try and find which locks are the best fit for the doors they have. We suggest that homeowners use ANSI (American National Standards Institute) Grade 1 Locks on the exterior doors of their homes. The grading is important because it gives you some insight into how strong your deadbolt is. These locks should ideally be deadbolt locks because they are a much better security option. Grade 1 deadbolt locks should be able to withstand 250,000 cycles and 10 strikes against the door. Their counterparts, the doorknob locks, should also be able to withstand 800,000 cycles, 6 strikes against the door, and a weight test of 360 pounds. We suggest Grade 1 locks because they offer more resistance to intruders and they have longer lifespans than other grade locks. If you need help trying to determine which locks will work for your door, and for other parts of your home, do not hesitate to give us a call so we can go over the options for your new lock installation. If your new lock installation is carried out by a professional home locksmith, then there will be no damage caused to your door. Our locksmith will have to drill the necessary holes in your door so that they can continue with the new lock installation, but this should not damage your door. It is important to make sure that your new lock installation is carried out by a professional because there are many parts of the installation process that could lead to a damaged door if it is not carried out properly. The only way your door will be damaged while a new lock is being installed is if a subpar locksmith is carrying out the task. The time needed for a new lock installation varies. This is because the time is dependent on a few factors. First, it depends on what material your door is made out of (which the locksmith should be notified of in advance) because the time varies for installing a lock on a steel door as compared to a wooden door. Most residential properties use wooden doors, but there are some exceptions. Secondly, the time will vary depending on whether or not the holes required for a new lock installation have already been drilled into your door. If they have not, it will take more time due to the fact that our locksmith will have to drill the necessary holes. Also, the time might vary based on which locks the homeowner wants to install. Some homeowners might merely want to install a simple knob latch bolt lock, while some would prefer to install both a doorknob lock and a deadbolt to make their door as secure as possible. When done by a professional locksmith, your new lock installation should take no longer than 30 minutes. Homeowners should go through the new lock installation process because their homes are valuable assets and investments. As such they want to make sure that their homes are as secure as possible. 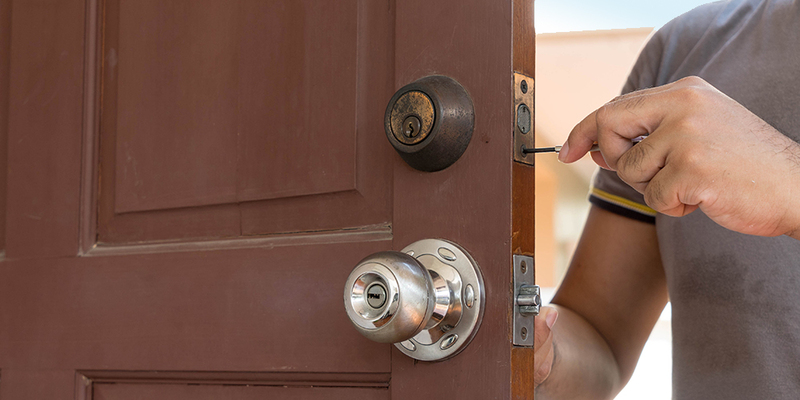 Installing locks on new doors in your home is an essential part of making sure that your home is safe. 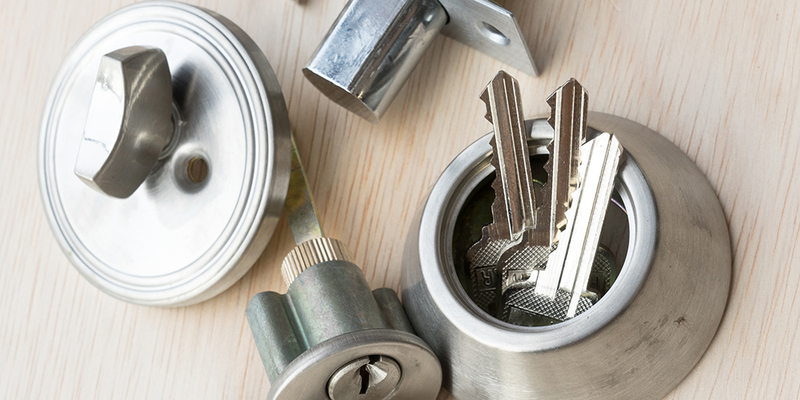 Make sure that you discuss all your options with our locksmith so that you choose the right locks for the door you have. Proper locks will ensure that your security functions properly. Before our locksmith can even begin installing a new lock on your door, the most important part of this process needs to be carried out. That process is the choice of the right lock for your door. You may be wondering what exactly goes into choosing the right lock? Well, we’re about to break it down for you. Deadbolts are bolts that are not spring-loaded, nor are they beveled. Spring-loaded bolts are ones that constantly have the bolt extended and they retract once the doorknob, lever, or handle is engaged, due to the contraction of the spring mechanism. These spring-loaded bolts work in conjunction with the beveled surface of the bolt. Deadbolts do not have any of these features. To retract or extend a deadbolt (essentially to open or close a deadbolt) a homeowner would have to use either a key or a thumb-turn to manually complete this action. As was stated earlier, homeowners should get a lock that is a Grade 1 approved, which basically signifies that it has gone through a series of tests and it has been classified as one of the strongest locks out there on the market. In addition to this, homeowners should aim to purchase locks that offer them key control and allow them to keep track of who has copies of keys to their home. Key control helps negate a plethora of scenarios, and it also helps reduce the chances of someone duplicating a copy of your key and this in turn makes your lock and your home more secure. It would also be beneficial to homeowners if their locks had some additional security features, which could be installed at the same time they choose to undergo the new lock installation process. Almost every lockset comes with a strike plate, it’s the equivalent of being served fries with your burger. However, not every strike plate that comes with your lock is the most secure option for it. Most strike plates are included as a necessity, not as a security feature so, more often than not, they are not the most secure option to be used in conjunction with your door. It is best to use a high-security grade strike plate that has a reinforced plate and that also has longer screws that make sure the strike plate is deeply set into the framing of the wall. Also, it is important that homeowners choose a deadbolt that is of adequate length. It is crucial to note that the length of the deadbolt, and the throw of the deadbolt, are two different things altogether. Make sure that these different components are not mixed up. The length of the deadbolt refers to its entire length, whereas the throw of the deadbolt refers to just how far the bolt extends out of the edge of the door. It is very easy for these two distances to get mixed up. It is recommended that the deadbolt you use on your door, have a minimum throw of 1”. For increased security it is always possible to get deadbolts that have longer throws, which in turn makes it much more difficult for the door to be bypassed. In addition to these homeowners should look for locks that have been crafted to withstand various forms of damage. For instance, some locks are anti-drill locks and others are equipped with saw resistant bolts. These bolts make it much harder for burglars and criminals to bypass the locks of your door by using forceful entry methods. Saw resistant bolts are deadbolts that come equipped with anti-saw pins, which spin back and forth throughout the length of the saw blade and this makes it very hard for the deadbolt to be sawed through. Anti-drill locks are made by placing hardened steel chips within the casing of the lock and directly within the path that a drill would take to damage a lock. These steel plates work against the drill, and more often than not, damage the drill to prevent it from damaging the lock. The importance of choosing the right lock with the appropriate features cannot be overstated. This is an important facet of making sure that your home stays as secure as possible. High-security door locks come in all shapes and sizes, so make sure you get the best front door lock for your needs. To begin the process of drilling holes, a few things have to be measured and marked on the door. First, locate where the handle should be placed on the door, and then mark of these points square around the door. The first hole that will be drilled into the door is the hole for the latch. It is important to find the center of the door edge that coincides with the points you marked across the door, so that you can drill through it with a spade bit. Measure the length of the backset of your lock, and mark the corresponding length (+ 2mm if need be to provide extra room) on the head of the drill bit. Most residential doors have backsets of either 2 ⅜” or 2 ¾”. A professional locksmith will have the necessary tools to carry out this lock installation process and they will know just how to handle all the complicated steps. It is important to measure the length of the backset so that you do not drill too far back into the door. Once the desired depth for the latch has been obtained, you will need to chisel out the proper shape, so that the lock can fit properly into the door. Chiseling out the desired shape is a pretty easy affair that involves tracing out the outline of the bolt, and then chiseling around the hole that was bored in with the spade bit. The same step is followed to chisel out the plate surrounding the bolt. After you have made the required holes for the depth of the latch you will need to drill the holes that allow you to set up the levers/knobs on both sides of the door. This is done differently depending on which type of door handle you decide to go with. For instance, for door knobs, you will need to drill a hole that corresponds to the size of the faceplate of the knob so that it fits in there perfectly, whereas, with the lever locks, you merely need to drill a small hole that allows the spindle to pass through from one side to the other. After the holes have been drilled and the spindle has been passed through the lock, the next step involves screwing the interior and exterior sections of the lock into the door. This completes one part of the lock installation process. The strike for the lock needs to be made next. The process of cutting out the strike is similar to the steps that were outlined above. The throw of the bolt needs to be measured out, and that corresponding length needs to be drilled into the doorframe. Keep in mind that the strike needs to be on the same level as the latch bolt lock that was inserted into the door. This is to ensure that once the door closes the latch will be resting flush within the strike. Deadbolt locks can be installed on their own, or they can be added to doors that already have latch bolt locks. They are meant to make doors more secure. Installing a deadbolt will make use of the tools listed above, with the addition of the hole saw. A hole saw is used to bore holes into the door so that the deadbolt lock can be properly installed. The size of the hole saw used, is dependent on the size of the lock that you wish to install. This method is the same for both thumbturn deadbolts and double cylinder deadbolts. The most important aspect of this process is making sure that the hole is properly drilled into the door. If it is not done the right way, the door might splinter and it will be damaged. To properly saw through the hole, make sure that you have outlined your starting points and marked them so you have a guide to follow. Proceed to drill through one side of the door, and only drill half way through. Next, begin drilling on the opposite side, and drill all the way through to the section that was sawed off first. This makes it easier for the whole to be sawed out. If you make the mistake of sawing through only one side, you run a risk of destroying the door in the process. The next step involves using the drill equipped with the spade bit to drill a hole through the edge of the door, so that the latch can be fitted into it. Once all these holes for the lock have been made, it is important to clean them out and chisel the edges so that they line up with the shape and style of the lock. This is important because it is one of the ways to ensure that the lock fits perfectly within the door. The latch is then inserted through the edge of the door and screwed in. Before the casing of the lock is placed over the lock and the tailpiece is placed through the latch, it is best to make sure that the bolt can be extended and retracted. It would be a waste of time to continue without actually knowing if the bolt is working properly. Next up, drill a hole into the doorframe so that the strike plate can be placed upon it. Once again, make sure that depth of the hole in the doorframe corresponds to the throw of the deadbolt, not the actual length of the deadbolt, but the throw of the deadbolt. Once the strike plate is screwed in, continue to finish setting up the lock on the door. All that is left at this point is to make sure that the tailpiece of the cylinder that sits within the collar is lined up properly inside the lock and that the bolts of the turn knob are also lined up on the opposite side. Essentially you want their internal components to be parallel to each other to make sure that the lock works without a hitch. Once everything is lined up properly and screwed in right, you should be set with your new lock installation.